As I mentioned in recent post about organizing setup packages one of my current goals is to simplify install routines. It is often easy to do with command line keys that force package into default install without asking anything. 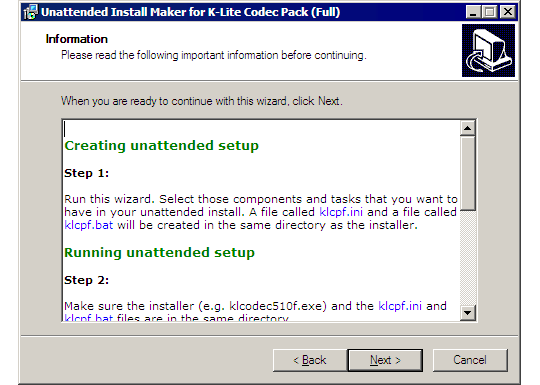 With K-Lite Codec Pack I discovered it is even more convenient than that. This will launch setup routine, similar to usual one, except that nothing will actually be installed. After you are done there will be two additional files created in same directory klcpf.ini and klcpf.bat (names may be different for another package, I use Full). INI file stores settings you chose and BAT file launches original setup package in silent mode, using selected settings. For newer setup packages BAT files will need to be edited to use new file name. this is totally off-topic, nothing about single-click installation etc etc. off topic post here. but its about codecs. its mainly for ppl into anime, since many fan-subs have different codec formats. its a all in one package, “insurgent” allows you to view all currently installed codecs. many fan-subs have different codec formats. Misleading. Fansubs tend to use advanced formats, but nothing different about them. K-Lite handles anime just fine.